Summary (from Goodreads): All year the half-bloods have been preparing for battle against the Titans, knowing the odds of a victory are grim. Kronos’s army is stronger than ever, and with every god and half-blood he recruits, the evil Titan’s power only grows. My Summary: It's the week before his birthday, and Percy can't wait to get away - Rachel's invited him on her family vacation, and he can't wait to leave behind all of the stress of the past year. Camp was exhausting, and he's spent so much time fighting monsters that it's become second nature to him. But before he can even pack, Percy's called off on yet another mission - to blow up Kronos' base of operations. 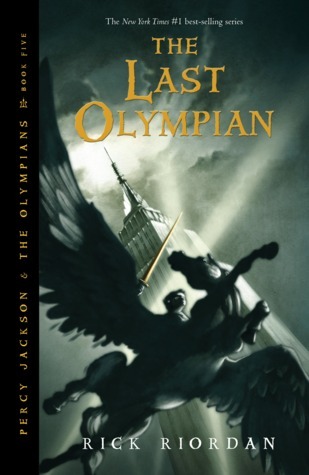 In this final installment of the Percy Jackson series, Percy must face dangers more terrifying than death in order to save Olympus and the rest of the world. But is he willing to do what needs to be done, when it could mean losing everything worth living for? My Thoughts: I just now finished this book, and all I have to say is WOW! I loved it. It was an amazing book - the best one of the five, hands down. Riordan's writing just got better and better, and I couldn't turn pages fast enough. I found myself thinking about the book during school, and I couldn't wait to get home to finish. Everything was just... perfect. Awesome. Amazing... along with any other adjective that starts with an 'A' (because it gets an A++ from me). Final Thoughts: I didn't want to go into too much detail in case I gave something away, so I'm just going to say this: you will not regret reading this series. It was exciting, interesting, and it kept me hooked until the very last page - and there's enough romance in it to keep all us romantics happy. I definitely recommend this series to anyone and everyone who enjoys a good adventure series. I am going to have to read these books, thanks to your raving reviews for them. I really wasn't that impressed with the move about Percy Jackson and the Lightening Thief (it changed mythology way too much for me to really appreciate the film).